It's a wide-open Kentucky Derby 138 folks. You can make a legitimate case for more than half the field. Here's an analysis of the pros and cons for each of the top 20 horses, pre-final works and post positions of course. Why he can win: He's earned 100+ Bris speed ratings in his last three starts. He has the right running style, which we saw in the Wood Memorial when he made a big move on the turn before gamely battling Gemologist to the wire. Breeding-wise, he should be fine at 10 furlongs. With the exception of the Breeders' Cup, he has been a very consistent colt. Why he can't win: I'm not sure there is a horse in this Derby with more controversy surrounding him. First it was the indecision of where he would run his final prep. It turned out that they got it right, but now there is this latest infection issue which everyone is still trying to figure out its severity. At the very least, it has altered his shipping and training plans, so instead of having his final work at Churchill it will come at Belmont. He'll also need a new rider, as Dominguez has chosen Hansen. That decision might not come until the weekend, or beyond. Why he can win: Also with three consecutive Bris speed ratings over 100, he turned in the most dominant final prep of anyone in the Arkansas Derby. The colt has brilliant natural speed and might get a good setup while running behind Trinniberg and/or Hansen. For my money, Bob Baffert is the best trainer in America, especially in big races. Why he can't win: The obvious negatives are that he is lightly-raced and didn't start as a 2-year-old. The whole Apollo thing. His natural speed also might be a detriment, especially if he tries or is allowed to go with Trinniberg early or stays too close to a quick pace. As good as he looked in the Arkansas Derby, he was facing very little. And now he adds eight pounds. If you're into the whole karma thing, Mike Smith switching to this colt after verbally agreeing to ride Daddy Nose Best before the Arkansas Derby doesn't "bode" well for him. Why he can win: Other than Gemologist, he's about as consistent as they come; he's never been off the board in eight starts. The colt hasn't missed a beat since last summer, with Harrington's plans going exactly as he drew them up. He ran a big race in his only start at Churchill in the BC Juvenile. He also has the right kind of running style and is always finishing at the end of races. Why he can't win: The removal of blinkers and his dislike of the whip has scared some people away. He never seems to run a straight line in the stretch. In his four losses he's been beaten a length or less in each. If he's in a stretch duel, he's shown he doesn't like to win. Why he can win: He looked awfully good in winning the UAE Derby, which came off a long layoff. He's the only horse in the field that has won beyond nine furlongs. Aiden O'Brien is one of the best trainers in the world. Why he can't win: His poor effort in the BC Juvenile can't be overlooked. There is an obvious question about whether he likes dirt, especially this dirt. He'll be shipping a long way and won't be arriving until Derby week. He's lightly-raced. O'Brien probably isn't even going to make the trip to Kentucky. Why he can win: He has a lot of bottom, having raced 10 times with four wins. He's the only horse in the race who has won twice at nine furlongs, and they came in his last two starts. In both of those races--the El Camino Real Derby and Sunland Derby--he had to overcome a lot. In the El Camino he was stuck on the inside the whole way and prevailed after a long stretch duel. His stalking style of running might be perfect for this race. He earned a career best 101 Bris speed rating in the Sunland Derby. He's been stabled at Churchill since the beginning of April and therefore knows the track as well as any horse in the race. Asmussen is a perennial leading trainer at Churchill. He is due to win a Derby, as is the colt's rider, Garrett Gomez. Why he can't win: He only has the two grade III wins, and hasn't exactly beaten the top horses in his class in either of them. His average Bris speed ratings are consistently below the top contenders. Gomez will be riding him for the first time. Most of his racing has come on turf and he has run a few clunkers, including a maiden start at Churchill last July. Why he can win: He showed a lot of grit in running down Morgan's Guerrilla in the Illinois Derby. If the race falls apart and someone comes from the clouds, he's a candidate. If you throw out the Gotham when he had a terrible start, he's a pretty consistent horse. Why can't win: He's too slow. He ran 1:53 4/5 in the Illinois Derby. That's sundial-like slow. 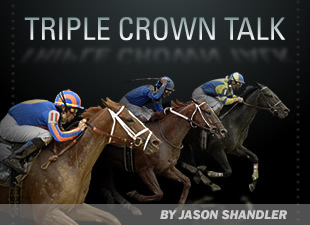 Why he can win: His Blue Grass stretch run was breathtaking. The horse is one that obviously appreciates more ground and if he stays out of trouble you know he'll be coming at the end. He doesn't win every time, but he hasn't missed a beat since he started racing last summer. He's in great form. Desormeaux has won three Derbies and nobody except Bill Mott has won more races as a trainer at Churchill than Dale Romans. He is the only two-time grade I winner in the field. Why he can't win: He's made three starts as Churchill and lost them all. They were his only three starts on dirt. Is he a better turf/synthetic horse? His record says he is. Why he can win: He has run three consecutive Bris speed ratings of at least 100. He's never run a bad race in six starts. He's a stayer, grinder type and has the ability to keep coming in the long stretch. Why he can't win: His stayer, grinder type style can also be a detriment, as he doesn't have that explosive turn of foot. Like Pletcher says, he's a lazy kind of colt. He'll be getting a new rider for the Derby (Bejarano). Why he can win: He's undefeated, which nobody else in the field can boast. He can stalk the pace under a great rider in Javier Castellano. He showed that innate intangible in the Wood that not every horse has--he's a fighter. He has a graded stakes win at Churchill as a 2-year-old. Pletcher/WinStar have been there, done that with Super Saver. Why he can't win: He's never been worse than third at any call in all five of his starts. With all the speed in this race, he won't be that close this time. Will that affect him? How will he handle a different type of trip? Hard to find any other faults with an undefeated horse. Why he can win: He won the BC Juvenile over this track. He has incredible speed and can carry it. He has a world-class rider who more often than not judges pace correctly. He should get to follow Trinniberg, and when he followed speed in the Gotham he was very successful. He's a cool-looking horse. Why he can't win: Ten furlongs could be beyond his scope, especially with his running style. He can follow Trinniberg, but if he is too close to a hot pace he might get cooked anyway. If he draws inside he might be in trouble. Post position will be key. Why he can win: His Robert Lewis win is still the most impressive prep victory I've seen. And he came right back to outduel Creative Cause in the Santa Anita Derby, which proved he could run consecutive top-notch races. Talent-wise, he ranks right near the top of this class. Why he can't win: There are lingering rumors about his soundness, especially after the shock wave therapy story came out and given his light schedule this year. Can he run three huge races in a row, the last one coming four weeks removed from his last start? He won't have a work at Churchill before the race, only a couple of gallops. Why he can win: Baffert has considered him a Derby contender ever since he won the CashCall. Apparently, he is training much better at Churchill than he raced at Santa Anita. Why he can't win: If Baffert knew he didn't like Santa Anita, why did he run him there three straight times? Tough to buy. He comes into the race off three below average starts--not exactly a confidence builder. Hard to believe a change of surface is going to move him up that much. Why he can win: He can stalk and carve out a good trip under Rosie. He's gotten really good in a short amount of time. He got a lot out of his last two preps, dueling with El Padrino in one and chasing down a pacesetter in another. Larry Jones knows how to prepare a good horse. Why he can't win: Not being able to run down 109-1 longshot Hero of Order in the Louisiana Derby didn't exactly flatter him, especially given how Hero of Order ran in the Blue Grass. He tries hard every time but looks like a one pace kind of horse. Might not be fast enough or explosive enough to beat 19 other horses. Why he can win: He's pretty consistent, having hit the board in six of eight starts. He took advantage of a hot pace in the Tampa Bay Derby and showed a lot of determination in the stretch. Why he can't win: His speed numbers say he's too slow. And he disappointed in his final tune-up in the Blue Grass. His only start at Churchill was the worst race of his career. Why he can win: He was making up a lot of ground late in the Louisiana Derby. Like the other deep closers, Trinniberg's presence in here will only help him. Jerry Hollendorfer is a Hall of Famer who has won a lot of big races. Why he can't win: He's too slow; has no tactical speed at all. Has never run a Bris speed rating over 94. He's winless in his last five starts and was soundly beaten in a couple of them. He needs the race to fall apart to have any chance. Why he can win: The aforementioned Asmussen factor. Asmussen has said from the beginning of the year that he planned to have him peaking in his third race off a layoff. Well, we're here now. Again, he'll need a pace meltdown to have any chance. Why he can't win: Hasn't shown the kind of speed needed to beat most of these. His Delta Jackpot win is long forgotten by now after being soundly beaten in his last two. His speed numbers are just too low to make a logical case for a victory. Why he can win: He just beat Derby favorite Union Rags, and did so with something left. He's no fluke, as he's been highly thought of since he was a juvenile and has faced many of the top horses in this field. Ran fifth in the BC Juvenile in his only start over the track; it was a solid effort considering his trip. He seems to be peaking. Calvin Borel. Why he can't win: He won't get an easy front-running trip like he did in the Florida Derby. Yes, he's proven he can rate, but his two best races were when he stayed close to the pace. I'm not so sure how effective he'll be when further back early on. He's been competitive in all of them, but has been beaten by a number of horses in this race. Why he can win: Because he's in the starting gate and any horse theoretically has a chance to win. Why he can't win: Would take too long to name them all. Let's just start by saying he's never gone two turns and he'll run too fast early on. If this race was a mile, I'd give him a decent shot. Why he can win: He's the most talented and physically imposing horse in the field. He's been beautifully managed by Matz since he was a juvenile and hasn't missed a beat in training. His last work was a thing of beauty. He ran a huge race in his only start over the track. Leparoux is as good as anyone riding at Churchill. He should carve out a stalking trip and should have learned a lot from the Florida Derby. The colt had a legitimate excuse in that race. His Fountain of Youth was more telling than the Florida Derby. Why he can't win: He didn't show the explosiveness we expected in the Florida Derby. He had excuses, yes, but he also had a chance to run down Take Charge Indy late and couldn't do it. Maybe 10 furlongs is beyond his comfort zone. Maybe he's not as good as everyone thought. Why he can win: I'm pretty sure Motion had a horse win the Spiral and go on to take the roses before. I can't remember who it was. He's not necessarily a synthetic specialist like that other horse, as he won on the Gulfstream dirt in March. He looks like a horse peaking at the right time, kind of like that other horse...oh yeah, now I remember--Animal Kingdom. Why he can't win: He's still learning; he didn't break his maiden until March 3 and he really didn't beat all that much in either of his wins. This might be too much, too soon. Decent pedigree, but doesn't scream 10 furlongs like Animal Kingdom. For analysis on the pedigree side of things, check out Derby Pedigrees Examined on the TrueNicks blog.